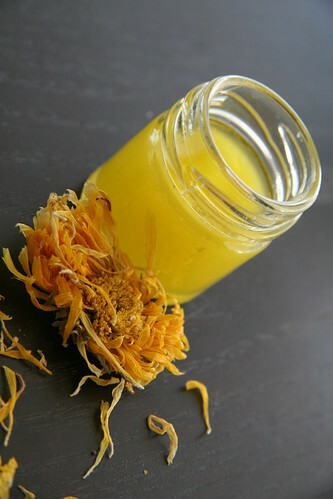 Create a healing salve with a calendula infusion, essential oils and butters. Calendula is known for it’s skin care properties and is widely used to soothe inflammation, control bleeding and heal damaged skin tissue making it perfect for use in ointments and salves. Combine all ingredients and heat to melt. Stir and pour into containers. Ingredients can be acquired from Mountain Rose Herbs. I can’t use shea butter, would you recommend a substitution, or just leave it off? How much flowers do you use? Grams or ounces. Can I ommit all the other oils and fragrance, if I’m using it to treat wounds? What can I sub for the almond oil? One daughter severely allergic. You can omit the shea butter and use double the mango butter or sub another butter of your choice. Chamomile, lavender and tea tree are all known for their healing properties. Omitting them will reduce the healing properties. Any carrier oil – ie. olive, rice bran, jojoba, etc. – can be substituted for the almond oil. Where do you find the flowers, and what do they look like? Calendula petals are the petals from the pot marigold. If they are out of season you can buy some dried from Mountain Rose Herbs.